What is Silver Pen Writers? We're an online community that encourages and fosters creative writing by providing peer review workshops. Hone your writing skills by uploading stories and poems to our workshops and by reviewing other members' works. 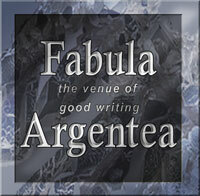 Or join us in our forums and discuss your writing experiences and questions. Our site is entirely ad-free and we totally understand privacy. Your work remains your own - we never claim any rights to it - and is visible only to other members. All interactions are friendly and respectful, reviews are helpful, and abusive behavior is not tolerated. We are a 501(c)3 non-profit organization and are here for all writers, experienced or novice, young or old. Membership is free. So join us today! The Workshop is for peer reviews of stories, poems, novels and essays. You must be a member to view and post work in our workshop. The forum is for discussions of writing issues and life as it affects you as a writer. We encourage all members to get to know each other and to learn about writing through discussions in our forum.